I specialize in Low Vision and Visual Rehab. Dr. Mogk is Chair of the American Academy of Ophthalmology Vision Rehabilitation Committee and the SmartSight Initiative in Vision Rehabilitation and Chair of the Michigan Network for Vision Rehabilitation of Seniors. Frequent presenter to professional and lay audiences on macular degeneration, coping with vision loss and vision rehabilitation. Dr. Mogk is the daughter of a father with advanced wet macular degeneration who bowled until age 95 and read until his death at 97, in spite of severe visual impairment. 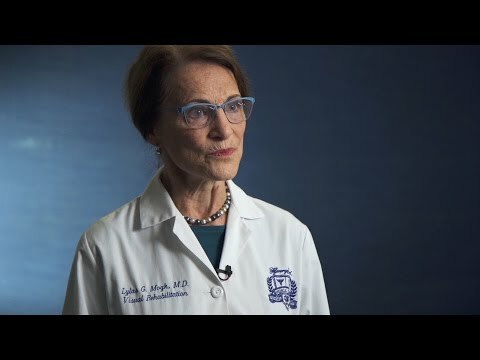 She is married to John Mogk, Professor of Law at Wayne State University and Chairman of Habitat for Humanity, Detroit; and has three adult children, one the co-author of Macular Degeneration: The Complete Guide. My mission is to empower those with vision loss to maximize their independence in daily activities, to preserve their dignity and quality of life and to retain or regain their joy in living in spite of vision loss. This is advanced by mastering the techniques and strategies of vision rehabilitation with training by the outstanding rehabilitation staff of our centers in Livonia and Grosse Pointe. Honorable Mention, Crain's Detroit Health Heroes, 2004. Secretariat Award, American Academy of Ophthalmology, 2002 and 2003. Literature Award, Association for the Education and Rehabilitation of the Blind and Visually Impaired, 2000.